This card is phenomenal. I can't say enough about it, but that sentiment is out of this world. Very nice note inside to our heroes also. enjoy your weekend. Love the sentiment. Great message inside. 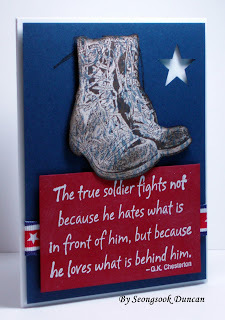 Love the sentiment and boot stamps that you used for your Any Hero cards. Thanks for sharing the message that you wrote inside. Love the OSW tutorial! Robin, in fact, it is a single stamp set. The boots are so nice and your card is beautiful. I love that you wrote inside of it and shared with us. What a great card. I love the image you used and the message is wonderful. Thank you so much for sharing what you wrote! One of the hardest things for some card-makers is figuring out what to say and now you have given them an example of one so they can be inspired to write their own! Your cards are really beautiful!! I love that your card is an Any Hero card! I know our servicemen and women appreciate hearing from "back home". TFS! What a great card! Love the image and the sentiment. These are great. Thanks for sending so many. Seongsook, Another wonderful set of cards! The boots and sentiment are fabulous and I love its CAS design. Thanks for all you do for OWH! What a special card. Our heroes are going to love receiving them. The boot stamp is so unique. I too thank you for sharing what you wrote on the inside. It has inspired me to get some hero cards finished too. Wow, those boots are amazing! I'll admit I haven't bought that stamp because I wasn't sure I could color them well, but you rocked them! And the sentiment is perfect. Thanks also for sharing the inside; although my day job is writing books, letters to someone I don't know are always more of a problem for me. Gorgeous cards and I love that sentiment! What a wonderful note too! Great image and sentiment. I've been putting of the one sheet challenge. Maybe I can do it this weekend, especially if it keeps raining. As always, you have created a unique card!!! I love the sentiment especially!!! Thank you for all you do for OWH!!! Those boots are just perfect. I want to try your OSW technique using 6x6 paper pads. TFS! Wonderful Hero cards. So thoughtful!! Wonderful cards. Love those boots and that sentiment is perfect. Terrific card. Never seen the boots stamp before. How fitting for todays card. Very nice indeed. Really like that image. Very nice card thank you. What a great card...I love the boots...and thanks for sharing what you wrote..it's always inspiring to see what others write, for those of us with writers block. Love the sentiment and the distressed boots are great! I love your cards. The boot image is great. TFS. I just love all your AnyHero mail you include in your boxes, Seongsook! Wonderful! Love this design, too, it's really striking! This is a great card - love that boot image! The boot image is great. Love your cards. Love these cards! The sentiment is just wonderful. Love your cards! I did your One Sheet Wonder tutorial and loved the way the cards turned out. Thanks so much for supporting OWH! The 12x12 OSW is on my list of things to try this weekend! Very nice, also liked your osw. Stunning cards. But your always rock! Love, love, love your cards! The colors, the image, the sentiment. Just wonderful! Thanks so much for sharing! I have your "one sheet wonder" tutorial on my list of things to do. Can't wait to try it! Great card, I like the star cut out. I love how you cut those boots out. Very symbolic. Your cards are always so inspiring. Very nice! Always like your cards! Love this sentiment because it is so, so true! And thanks for showing us what you wrote inside your Any Hero card. I've promised to make two, but not knowing what to say always holds me back. Thanks for your participation in the OWH Blog Hop! I've got this set and love to use it to make Any Hero cards for OWH. Like how you've used it. Thanks for all your support of OWH and our Heroes. Thanks for sharing the inside of your Hero card. Beautiful card! I have both of these stamps but have not yet used them. I love how the boots look stamped in black on the kraft stock and will definitely need to remember that when I manage to get these inked up. Thanks for joining in the hop and for supporting Operation Write Home! This sentiment is soo perfect. What a wonderful any hero card! Great set of cards! I love that boot image! Such a great card. I love that image of the boots. Really symbolic! Nice card. I did your one page wonder yesterday. I'll have to post it on owh. Perfect, Seongsook, as all your cards are. The boots is a very special image and reminder of our heroes. I enjoyed seeing your message to a hero. Some heroes are going to be very happy to receive you lovely cards. Thanks for supporting OWH and participating in the hop. Great cards! Thank you for sharing what you wrote inside. Wonderful cards. I love the sentiment stamp you used. Love the boots...beautiful card. Thanks so much for sharing! Yes, I wanted to show the punched star lets the card base show through and that I used it to decorate the inside of the card! Thanks for noticing it. I just love that boot stamp and the sentiment is perfect for any hero cards. WOW, that is such a true and touching sentiment you used. Took my breath away. Very nice note you wrote too, how special to whoever get yours cards. Beautiful work - the boots are an amazing stamp! I love this profoundly beautiful sentiment, such a lovely group of cards for our heroes. Your hero cards are fabulous, and TFS what you write inside them, as some folks don't know where to begin with their messages. You are an inspiration to so many cardmakers and OWH is blessed to have you on board! I hope you're enjoying your Memorial day weekend! And now I'm going to go check out your OSW and play along! Happy Memorial day weekend! Fabulous Hero cards and I LOVE the quote! I am amazed and inspired by how many cards you have made for OWH! I just made my very first one this week! That's one of 2 millions+ OWH cards now. Congrats! 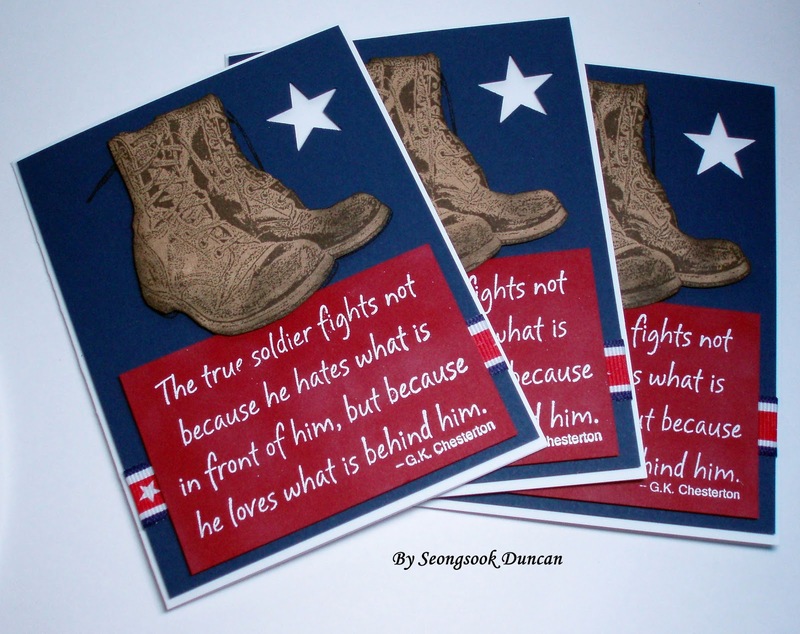 Great cards...thanks for supporting our heroes. Stunning card! Love the sentiment. Have an awesome weekend. Beautiful cards! 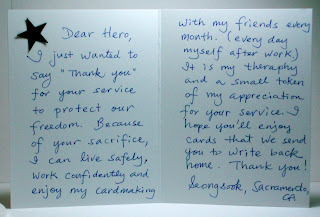 Thanks too for sharing your note to our heroes. I sometimes struggle with finding something to say. Stunning cards! absolutely perfect! tfs!!! Would you do it so that you will have a chance to win my blog candy? If you have a problem, please let me know. Wow, what a touching sentiment. What a fantastic AnyHero card! I love the sentiment! And thanks for including what you've written inside, it's helpful for those of us who are fairly new to this. wow, both the sentiment and boots images are awesome! Thanks Patti! By knowing that your son and son-in-law's services, your comments means a lot. I made 11 more of this cards and need to write inside. Writing AnyHero thank you messages, in fact, help me make more cards for them to write back home. Thanks again! I betcha those boots are going to resonate with our service men and women as the sentiment did with me. Terrific job! Thank you for supporting OWH. I am so jealous of your great embossing! mine never looks that nice! Fabulous cards- and thanks for sharing the inside of your card! Great card. Love the sentiment and boots. Thanks for sharing. Terrific cards! I love the strong bold color. Strong and bold like our Heroes! 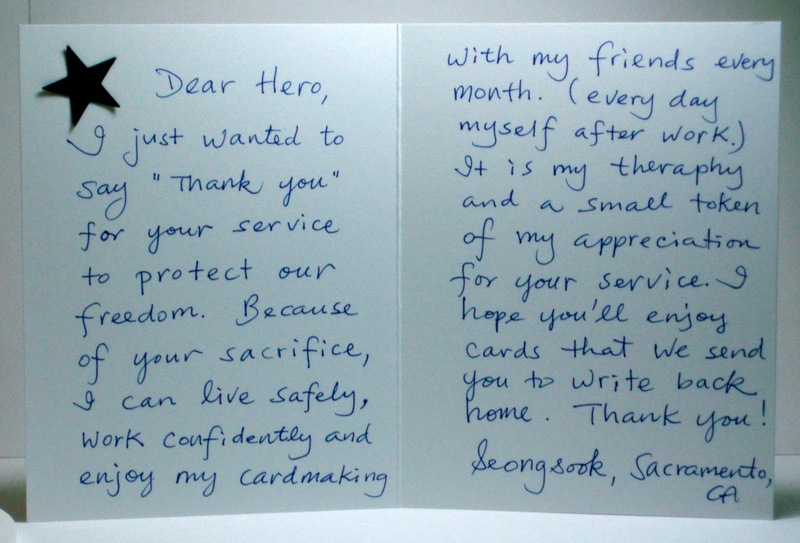 Thank you for sharing the inside of your card and thank you for supporting OWH and have a great weekend! Wonderful card for Memorial Day and quite sentimental. TFS your hero note inside too. Now I do have to get busy with some notes myself to add to my next card batch for OWH. Great card, very nice, love the boots, terrific message. Your cards are just wonderful! I really love that quote - it is so true! Thank you for sharing your wonderful Any Hero cards! Wow! Seongsook, your cards are always amazing! This one is no exception, it is fabulous!! Thanks for all you do for OWH! I love the boots on your cards! These are really wonderful! Your cards are perfect. Thank you for sharing the inside of the card. I struggle with finding the right thing to write. Nothing seems quite good enough. Wow....awesome cards. This really pulled at my heart strings. Great layout; great coloring. Thank you for sharing. These are awesome. The boots and sentiment are perfect. And very heart touching. Thanks for joining in and supporting. I love that the sentiment is the focal point of the card. The boots and star are just perfect. I can't wait to try this 1 sheet wonder technique. I took a peek at the template and hope to be able to get to it soon! Thanks for the challenge and for all your hard work on behalf of OWH! Wow, that sentiment and the boot image are so touching. Thank you for supporting OWH! Great card--I love how you photographed what you wrote inside--it helps me as I contemplate writing my any hero cards--I won't copy yours yet I will try to convey the sincere gratitude that you have shared. thanks for your support of OWH. I look forward to checking your blog out more and have become a new subscriber to your blog. thanks for the inspiration! Great cards! I'm in aw of the amount of cards you have done thus far! Great work!! I know the soldiers appreciate it! Awesome card!! LOVE the boots!! 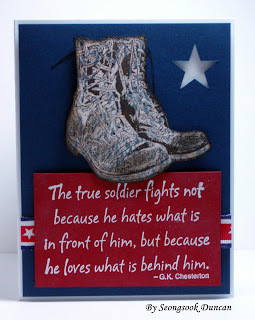 Fabulous card (sentiment and image) and wonderful words to a hero! Thanks so much for sharing and for supporting OWH! Amazing cards! They have such a profound impact! What a fabulous card. Love the boots and that sentiment! Seongsook, your cards are truly a work of art! Thank you for sharing what you wrote in the inside. It gives me a bit of an idea what to write. This is a beautiful thing you do. I enjoying making the cards as well. You have inspired me to write in my cards now and not just send the blank cards. I know they need both. Beautiful ! May God Bless you! Awesome cards, Seongsook! Love the chalkboard technique with these stamps, it looks fantastic! Oh wow! Ur boot stamp and sentiment are unbelievable! Such a special note inside!!! TFS! Awesome cards! Really love the boots and your sentiment! TFS! Perfection ! I like everything about your Any Hero cards, but the stamping the boots on patterned paper is my favorite detail. Thanks for sharing and sending your little pieces of art to our heroes ! Those boots are incredible! Love that punched star didn't go to waste but was added to the inside carrying on the theme. Wonderful cards! Love that sentiment...perfection!